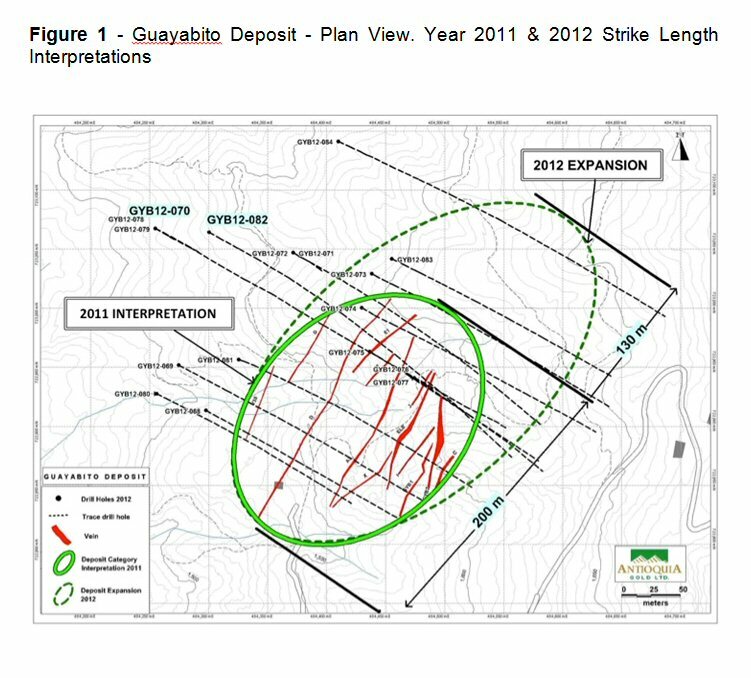 CALGARY, ALBERTA--(Marketwire - Sept. 11, 2012) - Antioquia Gold Inc. ("Antioquia Gold") (TSX VENTURE:AGD) (OTCQX:AGDXF) has received the assays of the last 4 of 13 completed holes from the 5,069 metres of Phase 1 drilling with positive results that continue to reinforce the previously reported significant dimensional increase of the Guayabito deposit to depth and along strike. Gold values from one hole graded 16.0 g/t Au over 3.3 metres, including 53.1 g/t Au over 1.0 metre and 84.0 g/t Au over 0.5 metres; another hole graded 31.2 g/t Au over 1.3 metres including 129.8 g/t Au over 0.3 metres. Highlights of the results for these holes are shown in Table 1 below. Phase 1 commenced on April 26, 2012 and focused exclusively on the Guayabito deposit and is part of a planned 3-phase 20,000 meter diamond drilling program at its flagship Cisneros Project in Colombia. 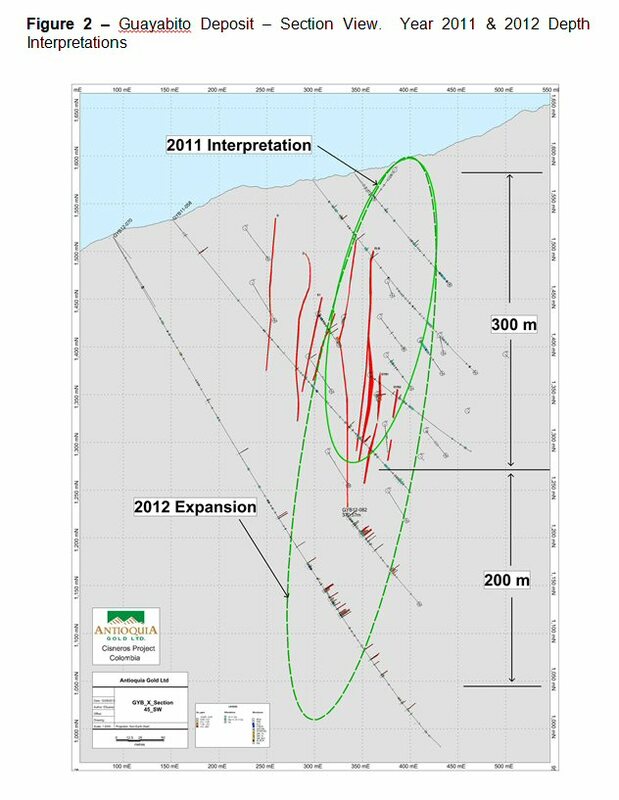 As reported in the press release of August 8, 2012, the program has resulted in expanding the length of known mineralized structures along strike to approximately 300 metres and has confirmed continuity to a depth of almost 500 metres with all structures remaining open along strike and depth. Also, several new mineralized structures were encountered with encouraging potential gold values. Plan and section views of the previous structures and the 2012 extension are illustrated in Figures 1 and 2 (and also found on the website www.antioquiagoldinc.com). ** These samples verified using Gravimetric finish. We refer the reader to the March 21, 2012 and August 8, 2012 News Releases for further background information. Phase 2, consisting of approximately 5,000 metres of drilling divided equally between the Guaico and Papi/Ivana targets continues at Guaico and has been completed at Papi/Ivana. Laboratory results are pending and the resultant review and interpretation by the geology team will follow. The regional exploration program continues on the other 90% of the Cisneros property with several of the regional targets identified under exploration. Field work is comprised of geological mapping, prospecting and soil geochemical profiles. The Cisneros property regional exploration program is an integral part of Antioquia Gold's future as it is designed to confirm the potential and the existence of multiple gold deposits on the Cisneros property. Antioquia Gold has been exploring for precious metals in Colombia since 2007 and has accumulated a land package of close to 40,000 hectares located throughout Colombia. Antioquia Gold's principal asset, which is being actively explored, is its 5,630 hectare Cisneros Project, located 55 kilometres northeast of Medellin in the Department of Antioquia, Colombia. At the Cisneros Project the Company has conducted extensive geochemical and geophysical programs over the entire property and has identified to date 11 exploration zones. On the original discovery zone it has drilled over 40,000 metres and is well versed in the understanding of the deposit type and the project's path to resource definition and production. Samples prepared by ACME (Medellin) are direct shipped to ACME Laboratories in Vancouver Canada, an ISO certified laboratory for analysis. Assay for gold (36 elements) is performed initially by 1Dx30g Agua Regia Digestion. Au values > 100,000 ppb are automatically checked by Gravimetric finish and AGD further checks all assay values ≥ 10,000 ppb by Metallic Assay. Furthermore, as part of the QA/QC program AGD has sent to SGS laboratory in Medellin Colombia batches of pulp samples for check Fire Assay's.